My TAVY Tile Puck is placed on the first piece of tile or stone and allows you to level this first piece easily in one operation. This process is repeated over the next row of tiles and then the Puck can be moved across these tiles that are set to check for any high spots. The 10 ounce weight of my Puck creates a definite clicking sound as high spots are found, which allows the tile setter to make necessary corrections before it's too late. The TAVY Tile Puck is great for setting tile, but bad for hockey. If you want to instantly know if your tiles are level and if you have a toe kicker…this is your tool. 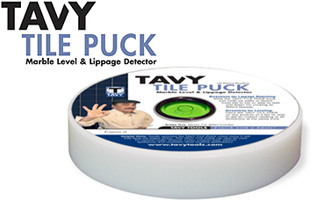 The TAVY Tile Puck is easy to use and will eliminate the need for any other level. The TAVY TILE PUCK can be also be used for any number of leveling applications: appliances, machines, shower seats, curbs, counter tops, kitchen appliances, cabinetry, drains, shelves and countless other leveling applications. Slide the TAVY TILE PUCK back and forth on walls or floors from tile to tile or slab to slab and listen for clicking to detect lippage. Place the TAVY TILE PUCK on any portion of any flat surface to get an instant reading in all directions at one time. Gently spinning the TAVY TILE PUCK when using it will help keep the edges sharp.